If there’s a boiler in your basement and radiators, baseboard heating units or in-floor radiant heating in your home, you’re just one of thousands of Minnesotans who rely on the silent, dust-free comfort you can only experience with hot water heating systems. Your home may be a charming or historical older home or a modern home designed for hot-water heat. Beginning after World War II, however, most new homes were designed for forced-air central heating and air conditioning, and had air ducts systems to deliver warm or cool comfort from a gas furnace and central AC unit. 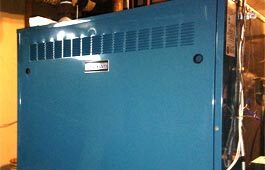 Now, in the 21st century, many Minneapolis St. Paul HVAC companies and contractors no longer install, sell or repair boilers. That’s not the case at our full-service heating and air conditioning company based in Minneapolis. We continue to provide expert, experienced, professional services to all residential HVAC equipment. Any time you need us, we’re always ready to provide annual maintenance tune-up services and fast repair. If you need a replacement installation for an old, failing unit, we are there for you as well. We supply a full line of efficient, affordable Slant Fin gas-fired, hot water boilers, radiators, baseboard units and accessories, along with equipment from other manufacturers. We offer fast, expert, efficient installation of these units at highly competitive pricing. 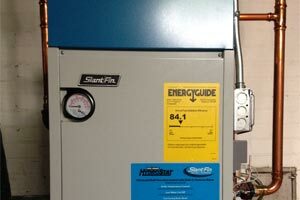 Among manufacturers of residential boilers and home heating radiators, baseboard heating units and accessories, Slant Fin is one of the most respected companies in the United States. Offering a complete line-up of hydronic boiler equipment, from affordable standard efficiency boilers to top-of-the-line high-efficiency models that can provide outstanding energy savings, it’s a top choice for many Minnesota homeowners. As the Minneapolis St. Paul area’s most trusted HVAC contractor, we highly recommend this brand, but can also supply equipment from other manufacturers. 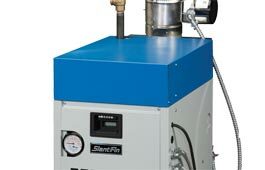 The Slant Fin boiler line includes models that are compatible with any home’s design and in a complete range of capacities to meet the needs of homes of any size. All offer outstanding warranty protection and are designed for fast, efficient replacement installation, long life, and reliable service. In a free, no-obligation consultation, we’ll evaluate the heating requirements and design of your home and then give you comprehensive price quotes on specific models from Slant Fin and other brands that meet your needs. The final decision is yours. 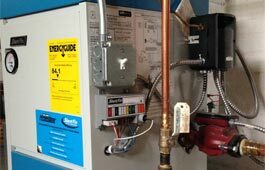 Like all mechanical systems, your boiler and its accessories require regular preventive maintenance and sometimes need repairs. As part of the complete service our Minnesota HVAC company provides, we respond quickly to all residential service calls. Our seasoned, continually trained service technicians are on call 24 hours a day, 7 days a week. They respond quickly with replacement parts for commonly-needed repairs. They are also equipped with state-of-the-art diagnostic equipment. Our company has direct access to fast delivery of all replacement parts from the Midwest’s largest HVAC parts warehouse. We’ll quickly diagnose the problem, give you an accurate estimate of the repair costs and get right to work with your approval. We also offer annual tune-up services and perform manufacturer-recommended periodic maintenance for all brands of equipment, including Slant Fin, Burnham, Buderis, Weil-McLain, Goodman, Rinnai, Carrier and Lennox. We’re always committed to restoring your home comfort as soon as possible and at highly-competitive service rates. In the rare situation where repairs are not possible or economically practical, we can supply and install a replacement system right away to prevent prolonged loss of heat. Home heating and air conditioning systems are a major investment for any homeowner. Every day, we are asked about how much a hot water boiler will cost. That’s a question we can only answer after a thorough evaluation of your home and its heating requirements. The total cost of a new boiler varies depending on brand, model, capacity, efficiency rating, installation cost and other factors. In our free consultations, we will give you fully-installed price quotes for a range of boiler brands and models that are matched to your home’s needs. We’ll also help you compare annual energy costs for different options so you can determine costs over time. We’ll answer all your questions objectively and then leave the final decision up to you. We never try to pressure you or try to sell you on equipment that gives us the most profit. Our primary goal is to provide you with the exact product that meets your requirements and budget. That’s how we do business. With over 35,000 satisfied customers in our 25+ years in the HVAC business, we’re proud to have maintained an A+ Better Business Bureau rating throughout that time. We believe that our outstanding record is based on our commitment to complete satisfaction for every customer in every job we do. Unlike many Twin Cities HVAC companies, we offer complete sales, installation and service for residential hot-water boilers, as well as central heating and air conditioning equipment. We also specialize in sales, installation and repair of ductless AC and heat pump equipment, which is ideal for providing cooling for homes that rely on hot-water and hydronic heat. We encourage you to call us for any issues with your home’s boiler, or for a consultation and price quote for a replacement or updated boiler system and accessories for your home. Let us show you how we have earned our reputation for unmatched quality of service.